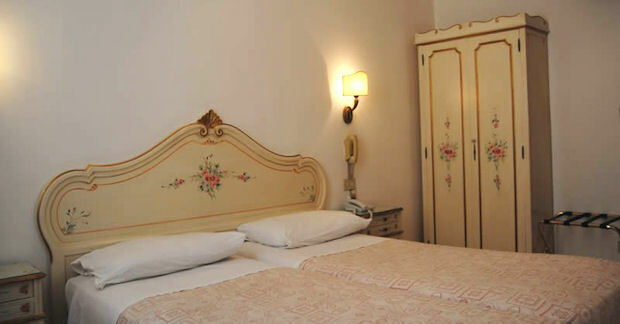 Hotel Guerrini is located in a quiet part of Venice’s historic center near the Lista di Spagna (tourist main street), 200 meters from the railway station and within walking distance of the Grand Canal where you will find the Vaporetto stops that provide access to the Rialto Bridge, St. Mark’s Square and the main islands of the lagoon (Murano, Burano…). This 2 Star budget hotel is managed by the same family for three generations, it has 28 fully equipped rooms, simple and functional decoration, some of them can accommodate families. Wifi access in all hotel areas. Leaving the Campo San Geremia (opposite the Hotel Guerrini), a pleasant walk takes you to the Ponte delle Guglie (sestiere di Cannaregio), the “Rio Tera San Leonardo” picturesque fruit and vegetable market, through the district Jewish Ghetto you get to the Rialto Bridge and the famous Piazza San Marco of Venice.